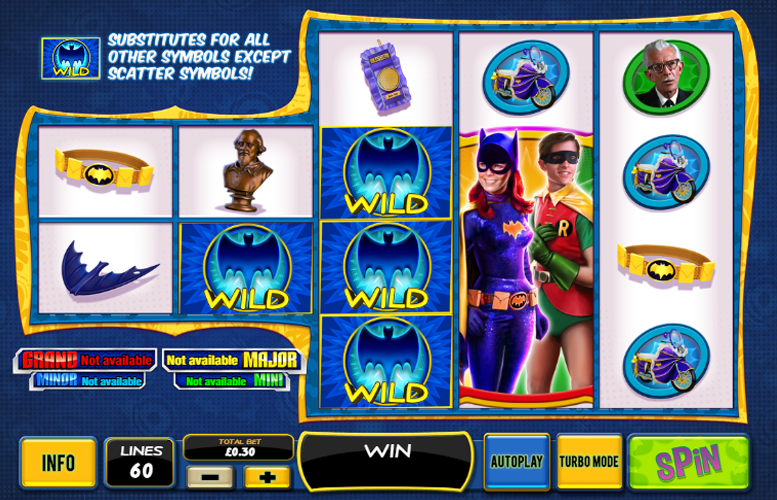 Playtech have created yet another slot based on the original adventures of Batman in Batman and the Batgirl Bonanza. This time our hero is joined by a female sidekick and with him as always is faithful Robin. The game is true to its subject matter and fans of the Adam West era Batman adventures will almost certainly get a kick out of playing it. The game’s features are what makes this one standout. It offers players the chance to win a lifechanging sum of money in its progressive jackpot game, and features both a re-spin and free spin mode. Unfortunately, the title is somewhat let down by its measly upper betting limit. This will likely put off some of those players who really want to splash some cash. Innovative approach to gameboard design. This provides additional replay value even for those slot veterans who think they’ve seen it all. Progressive jackpot. It’s possible to win some huge prizes on Batman and the Batgirl Bonanza. What’s not to like about that? Includes both a re-spin feature and a free games mode. This keeps the gameplay varied and will add to the slot’s appeal even after multiple visits. Low upper betting limits. Not all slots need to go right up to the absolute nosebleed stakes. However, £30 a spin will put off even some mid-stakes players. Lack of variation when it comes to deciding how to spread bets out. This is a minor quibble and some of the special features do warrant fixed win lines. Bat Logo = 2,000x the line bet. Batman = 400x the line bet. Batgirl = 250x the line bet. Robin = 150x the line bet. In addition to these payments, wins can be created by combining these character symbols. 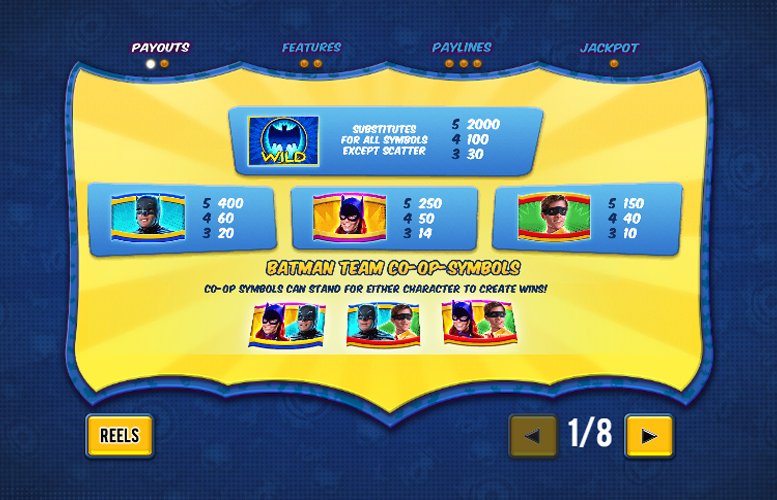 These are known as co-op symbols in the Batman and the Batgirl Bonanza slot. 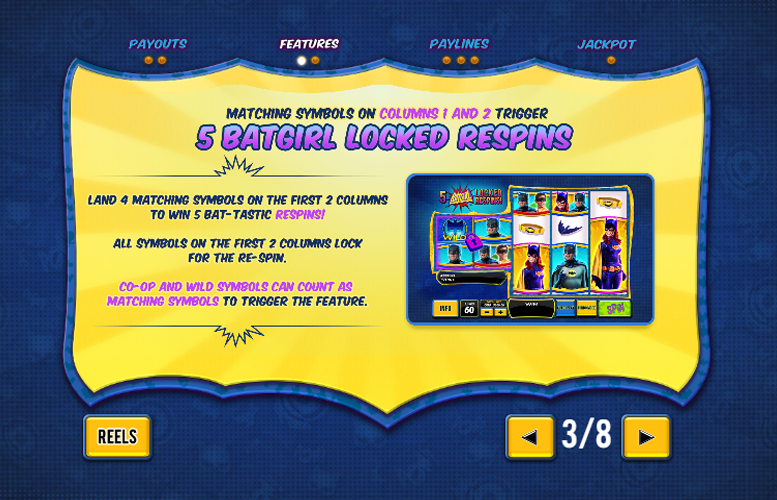 If players are fortunate enough to land four matching symbols on the first two rows, they’ll trigger Five Batgirl Locked Respins. During this special feature, all the symbols on the first two columns will lock in position. Players should note that co-op and “wild” symbols can also count as matching symbols. Therefore, they can trigger the feature too. Landing the “Bonus” symbol on row three, four, and five simultaneously will trigger the Batman Team-Up Free Games. During this mode players must match super heroes at the start of the feature to win 12, 17, or 25 free games. When the free games are active, the first two reels merge to form one reel filled with 2×2 super symbols. 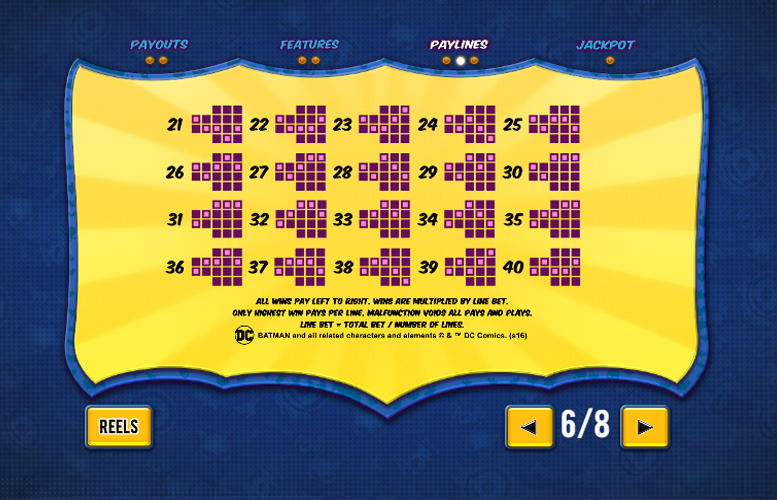 As with many of the Playtech slots dedicated to DC Heroes, Batman and the Batgirl Bonanza offers players the chance to win one of four progressive jackpots. This is their opportunity to drop some seriously lifechanging cash. 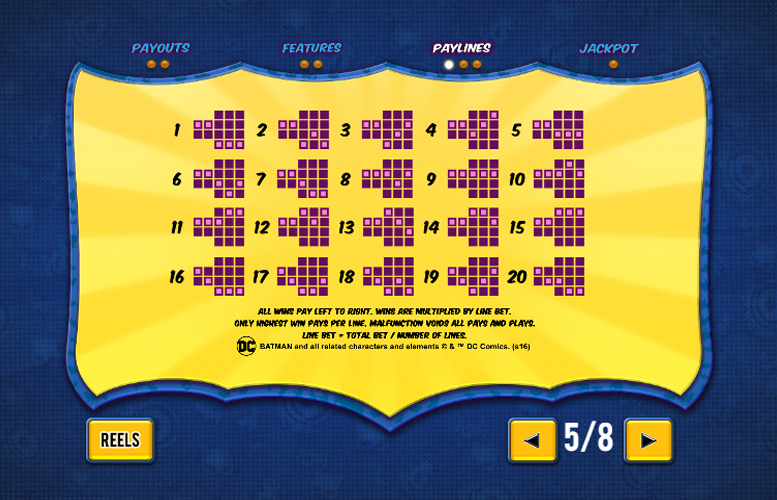 The progressive jackpot mode is triggered at random and any single spin can activate it. However, players should note that the larger the initial bet, the more likely they are to enter the mode. Once active, one of the four jackpots must be won. To play the game players simply pick the symbols from the grid. After selecting each one, one of four colours will be revealed. Each corresponds to a different jackpot. The icon is collected, and the player must then select another. The first of the four prizes to fill up entirely will be awarded to them. Alfred = 100x the line bet. Batgirl’s Batcycle = 70x the line bet. Walkie Talkie or Bust = 50x the line bet. Batbelt or Batarang = 40x the line bet. Since it uses such an innovative gameboard, the betting limits on Batman and the Batgirl Bonanza are less variable than on some machines. Players are only able to change the total bet option. Here, the minimum is just 30p and the maximum is a rather uninspiring £30. Clearly Playtech have not considered the needs of the highest rollers with this title. 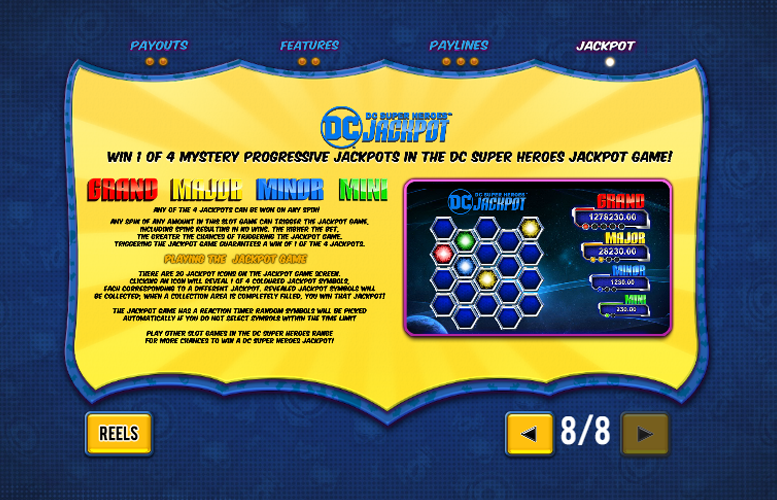 Batman and the Batgirl Bonanza is a solid slot machine with a strong theme and some great special features. We particularly enjoy the progressive jackpot mode since players are guaranteed to walk away with a juicy prize every time it is triggered. In addition, the inclusion of a free spin mode, a re-spin feature, and such an innovative game board makes for a title with considerable replay value. That said, there are a couple of drawbacks to the game. The major one is the tragically low upper betting limit. However, low-stakes players and fans of the original Batman franchise will almost certainly be able to look past this shortcoming. This game has a rating of 4 / 5 with 681 total reviews by the users.